Free Hot Water congratulates our neighbors at Santa Clara University for their solar thermal performance and innovations at the U.S. Solar Decathlon—and we also thank them for including Free Hot Water. Santa Clara called their entry “Radiant House,” a name that reflects a unique radiant heating and cooling system embedded in the home’s ceiling drywall. The system uses radiant panels to heat the house with hot water or cool the house with cold water, maintaining an optimal and comfortable temperature in the home. The Solar Decathlon is an international competition of university students who design and build a 1000 sq ft net zero energy home. Ten competitions, some measured and some judged, earn the home a score between 1 and 100. The home with the most points at the end of the competition wins. For the solar thermal related competitions, we’re grateful that the Santa Clara design and engineering team chose a Free Hot Water solar collector. Installed flat on the south side of Radiant House, the FHW 8000 series collector successfully enabled the home to deliver 15 gallons (56.8 l) of hot water (110°F/43.3°C) in 10 minutes or less. They completed this hot water task 16 times over the course of the competition, earning a near perfect hot water score of 99.063. In addition, Radiant House received first place in the Comfort Zone competition. Here, the team had to maintain interior temperatures between 71°F (22.2°C) and 76°F (24.4°C) and keep the relative humidity to less than 60%. Out of a possible score of 100, they scored 99.485. Radiant House also tied for first place in energy balance and finished 5th in engineering, in which a team of judges evaluated whether its radiant heating and other systems reliably worked as planned, as well as other criteria. When all the points were added up, Santa Clara finished 11th out of 19 international competitors. Team Austria finished first with Las Vegas taking second and the Czech Republic rounding out the top three. We’d once again thank the Santa Clara team for including Free Hot Water in Radiant House, and we congratulate all of the participants for their innovative solar thermal ideas and leadership. 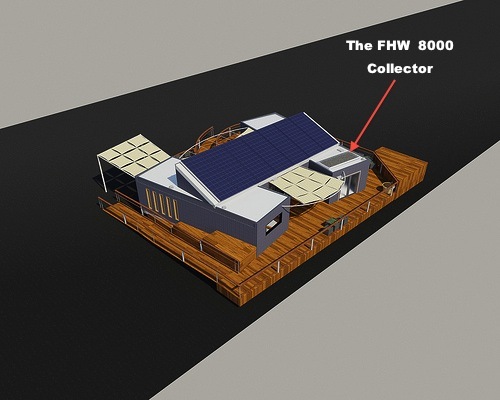 This entry was posted in 2013 Solar Decathlon, Residential Solar Hot Water, Residential Solar Water Heating Installers, Solar Hot Water News, Solar Hot Water Videos. Bookmark the permalink.